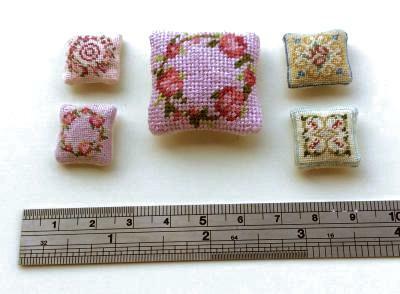 The 1/12 scale cushion is stitched using the 22 count canvas supplied in the kit. The half scale cushions are stitched on 48 count silk gauze with one strand of the Anchor stranded thread provided with the kit. Rikke added a few extra rows of stitching to make the sizes work as she wanted them to. From the top left, the designs are Kate pink, Flower ring pink in 1/24 scale, Judith, Prudence cream, and, in the centre, Flower ring pink again but in 1/12th scale. Aren’t they sweet when they’re so tiny? !